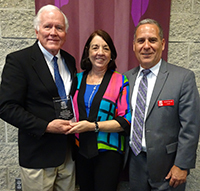 On Tuesday, March 7, 2017, CCC recognized Class of 1964 alumnus Edward Liddy as the inaugural recipient of the Distinguished Alumni Award for Inspiring Excellence. The Distinguished Alumni Award was created to ensure that the history and tradition of the school, as well as the contributions of individuals, are celebrated. 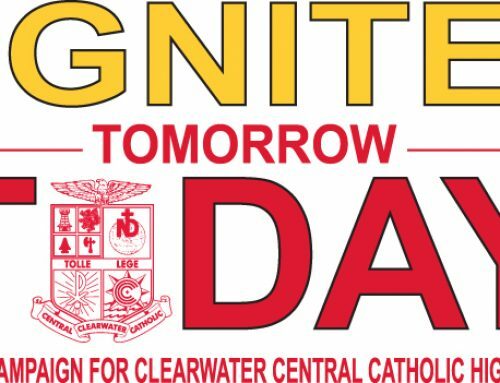 Its purpose is to honor, pay tribute to and perpetuate the memory of those individuals who have made outstanding contributions pertaining to the school’s four core values: Living Faith, Embodying Respect, Valuing Service and Inspiring Excellence. Mr. Liddy was recognized during an all-school assembly attended by students, faculty, staff, Class of 1964 alumni and members of the CCC Advisory Council. 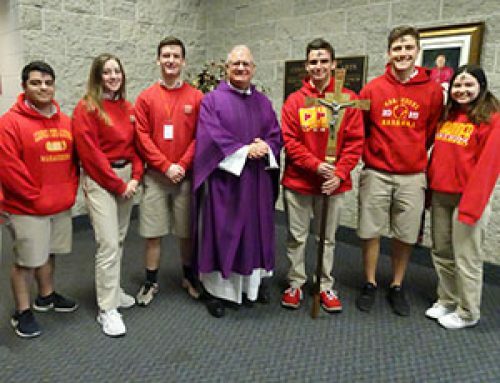 Mr. Liddy addressed the students about his Catholic education and career, and offered advice for success in life, college and beyond. Following the assembly, Mr. Liddy spent time speaking with the students in the IB Business Management class. An alumnus of CCC’s first graduating class, Ed Liddy was a member of National Honor Society and student government and played on the varsity football, basketball and baseball teams. He holds an M.B.A. from George Washington University and a bachelor of arts degree from Catholic University of America. He began his professional career at Ford Motor Company before joining Sears, Roebuck and Co. where, as chief financial officer, he led the successful restructuring of Sears into numerous public companies and led the initial public offering and 1995 spin-off of Allstate. Mr. Liddy served as chairman of The Allstate Corporation from January 1999 until his retirement in 2008. Less than six months after retiring from Allstate, at the request of the U.S. Government, he agreed to serve as interim chairman and CEO of American International Group, Inc. (AIG), in conjunction with the U.S. Government’s actions to provide stability to certain financial service firms. A dedicated philanthropist, Mr. Liddy currently serves on the board of Northwestern University; is a life trustee and chairman emeritus of Northwestern Memorial Hospital; a life trustee of the Museum of Science and Industry; and a life trustee and former national chairman of the Boys & Girls Clubs of America. He currently chairs the Commercial Club of Chicago.